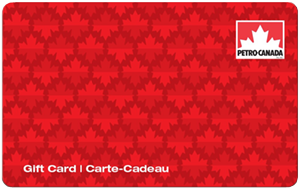 The Petro-Canada Gift Card can be used to buy anything at Petro-Canada from gas to convenience store items. Excludes purchase of gift cards. Use it to manage your fuel expenses. Ideal for emergency situations when your tank and wallet are empty. Great to give to other drivers in the household like students or young drivers. Earn Petro-Points™ rewards with every purchase.